My husband and I love to travel, especially south for 5 -6 months at a time. This presents a problem. Where do we live in between travelling destinations? Until recently, we had never considered house sitting as an option, until we realized we were technically homeless and I think our accommodating friends were getting a little tired of us. On our last two trips to Costa Rica, we met many wonderful people and developed a friendship with many of them. We discovered that some of them were house sitting for other people. The more we looked into this, the more interested we became. We already had about 5 years’ private experience looking after two huge dogs and a cat. We could do this! It didn’t take long for this to become a reality. Upon our return to Ontario, we immediately registered for for a house sitting company which is designed to match house owners with house sitters. This company was launched in 2010 and its mission, simply put, is to allow pets to stay safe and happy in their own homes. Imagine our surprise when we landed 4 house sits, back-to-back, all in Ontario. Over the next several articles, we will give you an idea of what we encountered, the people we sat for, the areas they lived in, what we learned, and if we would sit there again. Our first professional house sit was in Seaforth, a small Ontario town, located in the municipality of Huron East, in Huron County. 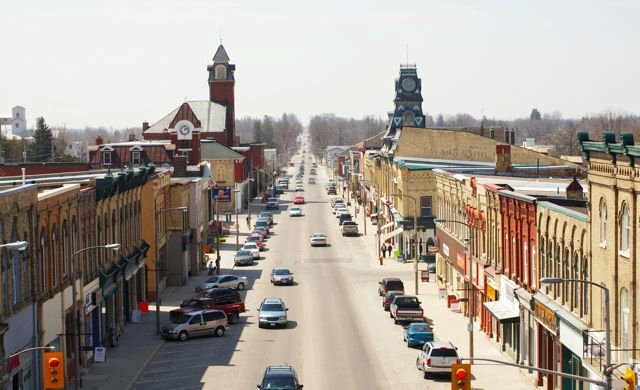 Seaforth’s Main Street is a Provincially Designated Heritage Conservation District, boasting sixteen municipality-designated heritage properties. Total population in 2016 was 2,680. Our stay was in a great location – walking distance to the town proper with a few dining establishments, unique stores for shopping, and tennis courts. My husband even donated blood as there was a clinic going on during our stay. We found the people warm and friendly. Our hosts, Annette and Brian, set the bar quite high for other house sits. 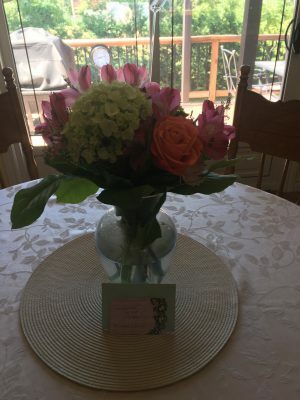 They not only presented us with a beautiful bouquet of flowers upon our arrival, they made sure everything we needed, and more, was provided for us to make our stay an enjoyable and comfortable one. Their home was lovely and clean and they were very generous in allowing us to use whatever we needed during our stay. 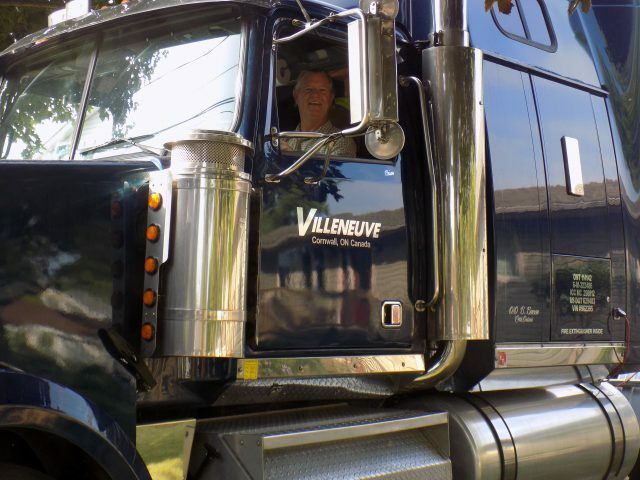 My husband, for some reason, has always been fascinated by semi-trucks – the huge trucks you see barreling down the highway. Well, Brian owned one and my husband had the ‘privilege’ of sitting in it every day for a few minutes. He was ecstatic! 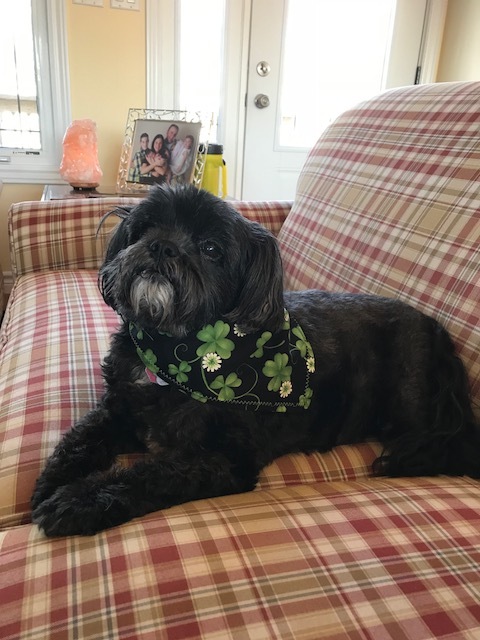 Pipi is a sweet, dainty, well-behaved 12 year old female Shih Tzu/poodle cross. My husband and I took to Pipi immediately and she, to us. Her routine was simple – walk first thing in the morning, one again late afternoon and a final pit stop about 8 p.m. She ate 3 meals a day with Omega 3 added for breakfast and an allergy pill at the evening meal. No people food allowed (!!) except for a small piece of cheese to hide her allergy pill. Pipi was affectionate and loved to be petted and have her belly rubbed. Since she is older and tiny and the bed was a King, we would lift her up to the foot of the bed at bedtime and then lift her off again in the morning. She would sleep all night with only a gentle snore to remind us she was there. She had her stash of toys and loved to play tug, although she was extremely possessive of her squeaky toy and would stop whatever she was doing if she saw one of us pick it up. Once she had it, she would take off with it. Walking Pipi was fun because we never knew where she would take us. She had about three favourite routes and we let her take the lead. The only thing I would say about the walks is that Pipi had to stop and sniff every single blade of grass, tree trunk or pole in her path. So, patience is needed! (1) Keep in contact with prospective hosts. Homeowners appreciate you keeping in contact with them BEFORE the sit. They want to get a ‘feel’ for who you are. After all, they are entrusting their most beloved pet(s) with you. They need to know you care and that it is not just a ‘house sit’ to you. (2) Be on time for your first meeting. Homeowners need to feel they can rely on you; that you can follow schedules and be on time. Can you imagine if you said you would arrive at 2 in the afternoon and you never showed up until 6 that evening, and didn’t contact them to explain why? Annette and Brian were impressed that we arrived when we said we would. (3) Have a list of questions ready. Every house sit will have a Welcome Guide but there may be some things not mentioned. The guide is easily accessible on line; some owners will print them off for you. You need to ask questions if they are of a concern for you. Perhaps it is where to dine, where the grocery stores are located, what is the security in the house, where is the vet located and how is he/she paid, where can you park your vehicle (this is a biggie if you are bringing your own). As I said, most of the guides will have all this information, but you need to be prepared. (4) Respect their rules about feeding their pets. This is extremely important. 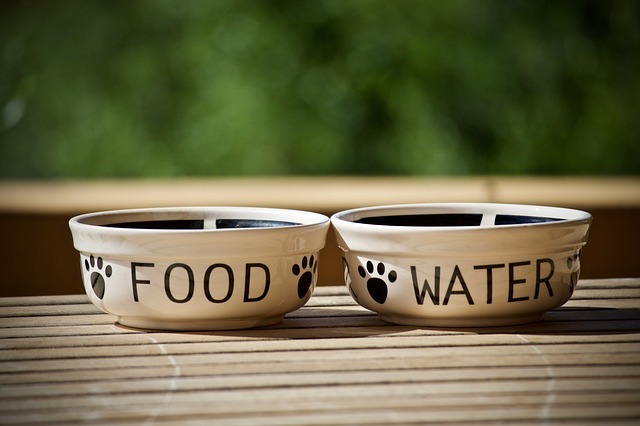 Owners know what their pets need. If they say “no people food,” they mean it. There is a reason for this. Respect their wishes and feed their pets accordingly. The last thing you want is to make them sick because you thought a little something different in their diet was OK. NO, IT’S NOT! Some pets require medication. Make sure you understand when and how this is to be given. (5) Reassure the host(s) during the sit. Keep in contact (unless they emphatically say no). This is especially important if this is the first time the owners have had a sitter. Give them updates and reassure them that all is well. Take pictures of their beloved pet doing things, interacting with you. They will not only love it but will feel good knowing they have nothing to worry about. The last thing they need to be concerned with, while they are miles away, is wondering if everything is OK. Make the time. In our case, we texted every day; it made a world of difference! (6) Helping yourself to what’s there. As I said earlier, our hosts were extremely generous and made it very clear that while they were away, their home was our home. They had well stocked freezers, fridge and cupboards and said ‘help yourselves.’ Here, I would suggest you use your own discretion. This could be one of the questions on your list for the owners. We replaced where we could, and tried not to take advantage of their generosity. This is your decision to make although I would suggest you go grocery shopping once in a while or dine out. Besides, it is fun to eat in restaurants you may never get a chance to visit again! Don’t assume you can use their computer/laptops, other technical gadgets. If it is not specified in the Welcome Guide, ask. The same goes for sports equipment, bicycles, kayaks, hot tubs, etc. Ask! Never take it for granted you can use these things if they haven’t said so. (7) Leave the home as you find it. This may not seem like a big deal, but it is. If the home you are sitting is spotless, then you need to make sure it looks that way when they come home. After a long trip away, owners don’t want to come home to dirty dishes, piles of laundry, etc. Do your best to keep it tidy, or at least make the time to clean up before they come home. This is only common courtesy. Remember, it is ‘their’ home, their casa! Give an honest review of the house sit, owners and pets. We couldn’t say enough good things about Annette, Brian and Pipi, and would love to sit for them again! Also, ask for one in return. We received a five star rating of our house sit. This was a ‘feel good’ house sit all around. You can also use this as an opportunity to fix what didn’t go right; what you would do differently next time. If you are not completely satisfied with the rating, ask why. Our first professional house sit was a resounding success. Not only did we make new friends, checked out an area we had not been to before, looked after the sweetest little dog, we feel we did it extremely well and can’t wait for our next journey which will be in Markham Ontario. Stay tuned for our next house sit. Check out TrustedHousesitters if you are interested in house sitting. Have you been the homeowner or the house sitter? What were your experiences? Was it a nightmare or a feel good sit? Let us know your experiences below. Wow, I also have a Shih Tzu/poodle cross, black with a white chin too! I can understand why the owners wanted a house sitter as poodles like routine and don’t like change much! House sitting is such a brilliant idea. I knew one couple who did this and they loved it. It’s really win win, since you get a place to live, you can travel around, and you get paid for it. The home owner gets a safe house and happy pets. Thanks for the tips and advice, I totally understand the one about respecting the pet feeding habits. Also about not taking advantage of your host even when they are being generous. I had heard of TrustedHousesitters before so its great to read a review to see how well it works. I’m assuming that someone who had a pet couldn’t do this? Hi Lucy. Thanks for your comments. With regards to sitting if you have a pet, no I wouldn’t let that stop you. I have a friend who just completed two house sits, one for a month and one for a couple of weeks and in both cases they allowed him to bring his Golden Retriever with him and they had other dogs/cats as well. I would always ask up front, of course. I was very surprised they let him. We had visited him at the one house sit and his dog was way better behaved than theirs was! If you decide to go for it, good luck :). Thanks, thats really good to know! You are welcome! There are so many opportunities and places to house sit.